If you or someone you know is a military veteran then check out this long list of freebies and great discounts for Veteran’s Day. Be sure to check the dates on the offers and to call ahead to confirm your store or restaurant is participating this year. As always, remember to bring proper ID or come in uniform to receive the discount. On November 11th, veterans and active duty military can choose from a free signature Thank You Meal menu that includes some of Applebee’s favorite items, including a 7 oz. House Sirloin, Bacon Cheddar Cheeseburger, Three-Cheese Chicken Penne, Fiesta Lime Chicken, Double Crunch Shrimp, Chicken Tenders Platter or Oriental Chicken Salad. Must present valid Veteran’s form of identification or be in uniform. From open to close November 10th and November 11th every Bar Louie location across the country will offer veterans and military personnel a free appetizer or meal when you show valid military I.D. or other proof of service. On November 11th – free lunch entree up to $9.95 value to all active duty military and veterans, with proof of service. On November 11th – Free all you can eat hotcakes for active duty military and veterans with ID or proof of service. California Pizza Kitchen – Veterans and active military can choose a pizza, full size salad, or pasta from the special Veterans Day Menu. Dine-in only on Nov. 11. On November 11th – Free appetizer of your choice for active duty service members and veterans. Military ID or proof of service required. Veterans and active-duty military eat free on November 11th. Valid ID required or in uniform or photo in uniform. On November 11th get a complimentary All-American Burger with fries to active and retired military personnel. Dine in only and must purchase a beverage and present proof of service. Chili’s – On November 11th, Chili’s is offering all military veterans past and present their choice of one of 7 meals during the dinner hour, or any lunch combo during lunch. Offer only available at participating Chili’s in the U.S. only. Dine-in from limited menu only; beverages and gratuity not included. Veterans and active duty military simply show proof of military service. On November 11th enjoy One Meat Salute – choose from one meat, a corn muffin, and a side at participating locations. Denny’s — Active, inactive and retired military personnel can get free Grand Slam on Veterans Day nationwide. On November 11th – Free coffee at participating locations. Available to all active duty members and veterans with ID or proof of service. On this Veteran’s Day, Veterans and Active Duty military can enjoy a free entrée up to a $13 value. On November 11th – Free meal for military and veterans. Proof of service required. Monday November 17th from 5 PM to 9 PM get a free Veterans Day buffet and beverage to any veteran who has served in the United States military or is a current active duty service member. All Golden Corral locations will be participating. Hooters –Veterans and active duty military receive a free meal up to $10.99 with drink purchase on November 11th. November 11th from 11 AM to 9 PM veterans and active duty eat free from a select menu. On November 11th – Free doughnut and small coffee. Participating Krispy Kreme stores only. Offer available to all active-duty, retirees, and veterans. Call ahead to verify your local Krispy Kreme is participating. On November 11th – All veterans and active duty military will be eligible for a free Starter. Must show ID or proof of service. Call to confirm participation. This Veteran’s Day enjoy free Texas Tonion and non-alcoholic beverage. Offer good for Veterans and active-duty military members. Proof of service required. On Veterans Day, November 11th, participating Max & Erma’s locations are celebrating veterans and active military personnel with a Cheeseburger, choice of soup or salad and a chocolate chip cookie. Dine-in Only. Enjoy a complimentary entree on Sunday November 9th. All veterans must show official verification. Dine-in only. On Veterans Day, November 11th veterans and active duty personnel get a a free 6 oz. frozen yogurt. Show a valid ID or be in uniform to receive. All veterans and military active duty will receive a free meal from a special menu on Veterans Day. Also, their families get 10% off their orders. All veterans and active duty military will receive a free entree from the “Create Your Own Combo menu” on November 11, 2014. On Veteran’s Day, November 11th, all veterans, retired and active-duty military personnel receive a free cup of frozen yogurt, up to 11 ounces. Proof of military service, such as a military ID card, uniform photo, honors, badges, or come dressed in their military uniform is required. Go here for locations. On November 11th – Active service members and veterans enjoy a free Magnificent Seven meal which includes two eggs, three buttermilk pancakes, and a choice of two bacon strips or two sausage links at participating locations. Beverage not included. Must show ID or proof of service. Enjoy a free Appetizer from a select list on Veterans Day with military ID or proof of service. Shoney’s says ‘Thank You’ to America’s heroes by offering Shoney’s All-American Burger to All Veterans and Active Duty Military Members on November 11th. Active duty and retired members of the military get a free lunch on Veterans Day, November 11, 2014 until 4 p.m. Guests with proof of military service will select a six-ounce six-ounce Tri Tip Steak, single Malibu Chicken or a half dozen Fried Shrimp entrée with a choice of side dish. On November 11th choose 1 original spaghetti entrée or 15-layer lasagne, get the 2nd entrée free. Find a location near you. On November 11th at every Texas Roadhouse location enjoy a free lunch by choosing from one of 10 free meals, including sides and a drink. Offer good for all active, retired or former U.S. military with ID or proof of service. Dine-in only. Veterans and active duty military service members are invited have lunch on T.G.I Friday’s this Veterans Day, November 11, from 11 a.m. to 2 p.m.
On November 11th all US locations are offering a free donut to all active duty service members and veterans. No purchase necessary but must show ID or proof of service. All active duty, reserve and retired military and veterans receive a complimentary free Shrimp Skewer Nov 8 through Veteran’s Day, November 11th. 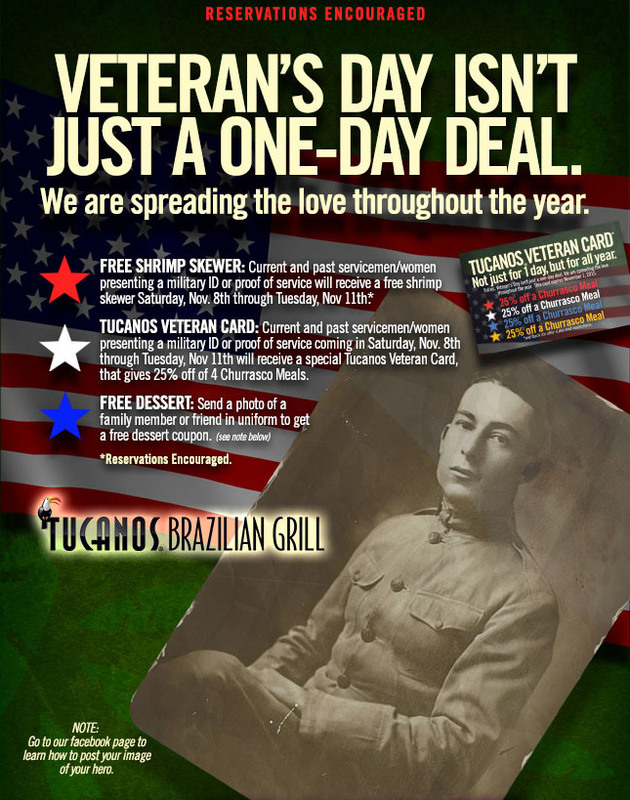 Also receive a Tucanos Veteran Card and enjoy 25% off 4 Churrasco Meals and send in a picture of a loved one in uniform to receive a free dessert coupon. On November 11th the first 100 servicemen and women will receive a free Twin Peaks calendar with $160 in coupons. In addition all active and retired members of the Armed Forces are invited to visit Twin Peaks for lunch or dinner and select any meal from the Twin Peaks menu. On November 11th enjoy a free individual pizza or entrée with the purchase of a pizza or entrée of equal or greater value. Available for all active duty and veterans with ID or proof of service required. Some B&Bs belonging to the CABBI association are offering military specials in conjunction with Veterans’ Day (November 11th). Some Inns are extending the special through the month of November or keeping year round. Everybody gets free entrance to our National Parks on Veterans Day, November 11th. This list will be updated as more information is provided by restaurants, retail and other vendors. Previous post: Snap Circuits Jr. SC-100 Kit only $20.99!